Bed bug bites are often very difficult to distinguish from other bug bites. Even trained physicians frequently misdiagnose bed bug bites. An additional problem is that bed bug bite symptoms can vary from person to person. Some people don’t react at all, and won’t even know they are being bitten, while others can get bit once and have a large reaction. Red areas on skin, often resembling a rash. Bed bug bites typically have a small dark circular area in the center of the pink blotches. Bites are close to each other, often in a cluster. Bites often merge together resembling a larger bite. Bites may also be in a line rather than cluster. One important item to note is that bed bug bites are painless. Bed bugs inject both an anesthetic and an anticoagulant that results in no pain being felt during the bite. Many people assume that if they have bed bug bites, they will know they’re getting bitten. This is not true. Bed bug bites can also appear within a few hours but can also take days to appear as well. Bed bugs often stay together. If a person lays up against a crease or fold in the bed, there will often be multiple bugs in the location, resulting in multiple bug bites. The number of bites is not and indicator of how many bed bugs you have. Of critical importance is to avoid scratching bed bug bites. 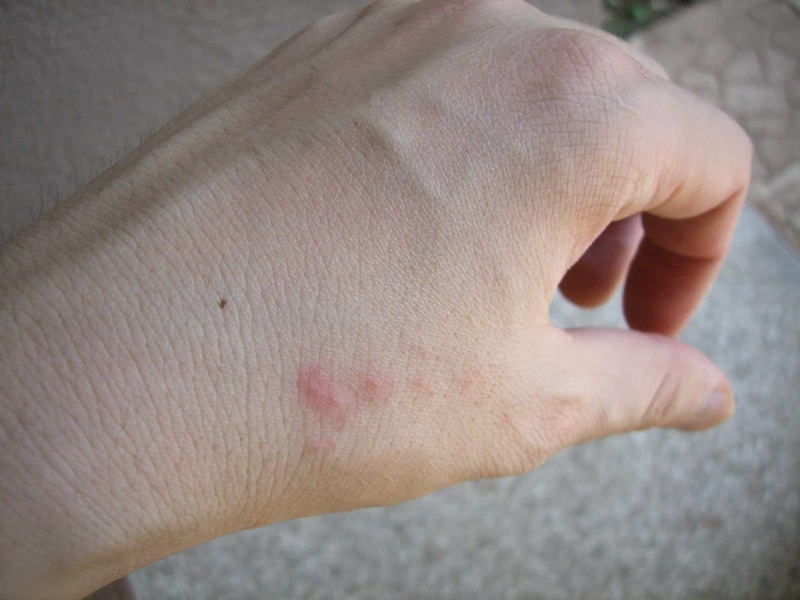 Frequent scratching can result in the skin breaking and infection. There are fortunately a number of over the counter options for bed bug bite treatment. If bites are severe, or over the counter solutions aren’t working, we recommend consulting a physician. Visit the bed bug pictures gallery to more pictures of bed bugs and their bites. While treating bed bug bite symptoms can stop the itching, it will not get rid of the bed bugs. You must treat the problem and remove the bed bugs from your home. Please refer to our bed bug treatment page for all the various treatment options. If you are unable to remove the bugs using natural or commercial solutions, we strongly recommend calling an expert bed bug exterminator. While expensive, these are often the only way to completely remove bed bugs.